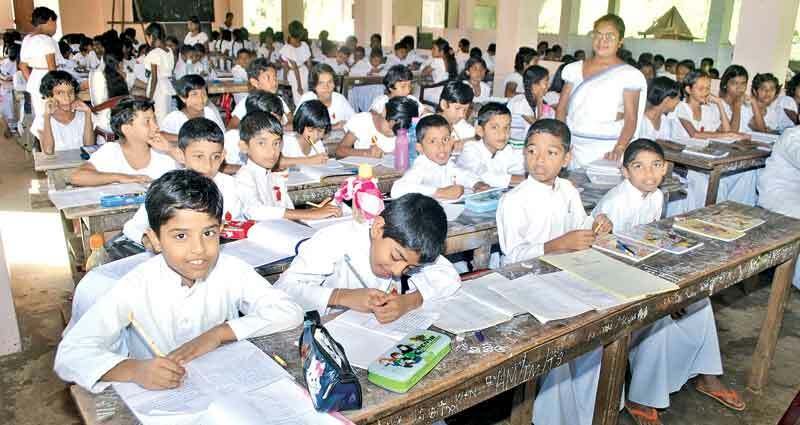 The news-media recently carried reports that the Education Ministry is planning to set in motion a process of education reforms. It will no doubt be most welcome since much is to be desired in the education system as prevailing today. New demands are constantly made emphasizing the necessity to ensure that education is kept relevant, result-oriented and above all consistent with the national development goals which should necessarily reflect in the National Educational Policy. It is also abundantly important to keep abreast of new trends in education constantly being experimented upon and implemented all over the world. It is incumbent on those in charge of education to ensure that we do not lose track of new happenings in a world which is experiencing a knowledge explosion in all aspects of education. Reforms that are envisaged should no doubt lead to a good hard look at the content and delivery of education from primary to the tertiary level, identifying the gaps and growth points in the existing system and making informed decisions whether the right system is in place to address both the current and emerging needs of education in the country. If the answers are in the negative, needless to say, immediate steps should be taken to bring about the necessary changes in the system as a whole inclusive of setting up new institutions and structures if deemed necessary. The flaws prevalent in the education system are also the reason for extensive lawlessness among the youth of the country including drug abuse and its nasty implications to the well-being of the society at large. It has also made a mockery of university education churning out disillusioned graduates with unemployment and a bleak future staring them in their face. This is not because they are not educated but because they are educated for unemployment and not employment. The world, as we see it today, consists of a large number of developing countries that are trying to emerge from years of neglect and exploitation. Sri Lanka is one of them. It has to be understood that no country can develop unless it concentrates its energies on developing and nurturing their human resources. That is precisely the function of education. One question that needs to be asked is whether our education system from primary to tertiary is geared to develop human resources. Are they sufficiently equipped when they enter the world of work, to lend their shoulders to whatever development tasks for which human resources with job-specific skills are called for? When Lee Kwan Yev took charge of a mass of land which we now call Singapore, it was only a backward village, without any material resources except the sea surrounding it. But he had a vision to turn it into a flourishing state as we see it today. He was able to accomplish this during his life time, because he had the vision to start off this fantastic development process by first developing human resources. This was done by revamping and rebuilding the schools and other educational institutions to cater to the development needs of the new nation. The end-result was the emergence of an educated and responsible citizenry. Not only did they have the needed technological know-how, but also a deep sense of ethics and love for their country. Singapore is now widely recognized as a shipping hub, financial hub and above all an educational hub. It has to be remembered that Sri Lanka was far ahead when countries like Singapore were struggling to stand on their feet. But with lethargy and a sense of complacency setting in, we started lagging behind. This I attribute to the lack of forward thinking, lop-sided planning and the sense of one-upmanship displayed by politicians not concerned of the common good. Hence while acknowledging the importance of education reforms to ensure the system continues to deliver the desired objectives of over-all national development goals, it has to be noted that those who are charged with the reforms should be given a free hand to have discussions with all concerned parties in this field. It has to be emphasized that unlike in other areas of social activity every member of the society has a stake in education be it the students, the teacher and school principal, the university lecturers, parents and even grandparents. The authorities have to be sensitive to the opinions and reservations expressed by these stakeholders on any issue pertaining to education. Creating awareness on key areas that are subject to reforms and developing a consensus among interested parties should be the main objective. In the case of contentious issues with varying opinions it is advisable to encourage a national debate where the mass-media, both electronic and print could be widely used. Ultimately when the reform package is announced the stakeholders should feel that their voices were heard during the reform process and they had the opportunity to contribute to its outcome. The other matter of paramount importance is the need to get the opposition on board to ensure there will be continuity when it comes to implementation of the reforms that are recommended. We have to recognize the fact that in any active and vibrant democracy the opposition is regarded as the government-in-waiting. When a new government is formed there is always a tendency to tinker with education. At times this even leads to throwing overboard the entire system put in place by the previous government. This is indeed unfortunate because it leads to the student becoming mere guinea-pigs in experimentations driven more by political expediency than by educational considerations. Most of us vividly remember the 1970s when extensive educational reforms were affected with the introduction of pre-vocational studies from Grade 6 onwards and National Certificate of General Education (NCGE) introduced as the terminal examination instead of the all too familiar GCE. While most of those at the receiving end of these reforms are around holding different responsibilities in society some of those at the giving end working at the Education Ministry implementing the reforms like the writer himself are also around to recount the disastrous consequences faced by the students when the reforms were totally rejected by the government that was installed after a subsequent election. This resulted in the students who followed the NCGE syllabus being placed in a quandary. Some of those who sat the NCGE examination had to face the sad prospect of preparing and sitting for the GCE. The prevocational studies that were assiduously taught and learnt by all students in the country gave them for the first time hands-on experience in accordance with the highly acclaimed UNESCO principle of “learning by doing”. Because of this new change neglected spaces in the school compound were turned into vegetable garden and model farms. Spare classroom became veritable workshop. Students while preparing for their normal subjects were given the opportunity to develop their psycho-motor skills. Some even acquired sufficient skills in art and craft to be self employed in later life. On the whole good thinking had gone into the introduction of the new subject. Teachers too were trained in Teachers colleges’ to teach this subject and community education was made an integral component of the teacher training syllabus. It was indeed sad when the whole scheme was stalled with the change of regime putting the students in total disarray. In retrospect the writer strongly feels that the regime that introduced these reforms, however relevant it may have been, should have concurred with the opposition to ensure continuity. “One upmanship” when it comes to education can be disastrous and should be avoided at all cost. Educational reforms have to be seen as an exercise that prepare students to face the challenges of tomorrow, and hence all stakeholders must be involved in the reform process.